On August 21, 2013, Sean Boushie signed a sworn affidavit before a notary, and he swore that he was a victim of assault by Bill Windsor. The false sworn affidavit was used to get William M. Windsor arrested and jailed for 134 days. “I am a victim of assault." Bill Windsor never causeed bodily injury to Sean B**shie. He never made physical contact with him. IF he ever saw him in August 2013, it was from at least 100 feet away while Bill Windsor was waiting for the police to arrive. Sean B**shie knew that Bill Windsor is absolutely non-violent and had nothing but pepper spray in Montana. 5. Sean B**shie admits in Joeyisalittlekid.blogspot.com that he is both John Smith and TinyFeetNhands. Ask him. If he admits it, you have the evidence needed. If he denies it, prove he lied with the evidence from Google (Blogspot) and Joeyisalittlekid. 6. Review the University of Montana Police Report filed against Sean B**shie by William M. Windsor. Review the University of Montana Police Report showing no complaints by Sean B**shie against William M. Windsor at any time. 7. 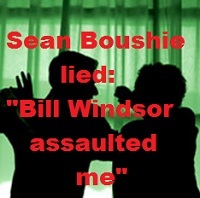 Ask Sean B**shie when he was ever in Bill Windsor's presence. He wasn't, unless it was when he was stalking Bill Windsor. 8. Ask Sean B**shie for 911 call dates and police report numbers. There are none.